Catching up with OneAreaCode's Brett Box | YouGotThat! OneAreaCode founder Brett Box has put in countless hours, dedication and money into something he really believes in: giving skateboarders a better chance in life whether it's progressing on a skateboard, doing better in school, helping out at home or just trying to be a better person in general. 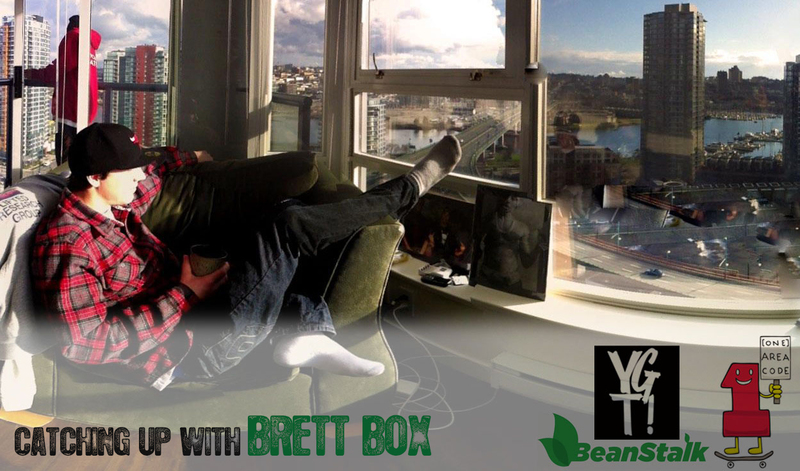 Almost a year ago we sat down with Brett and put together our first joint effort, Brett Box: Stepping up to the Plate. Since then a lot of progress has been made, and with the release of OAC's first program, "The Beanstalk," I figured now would be the perfect time to catch up and see what's new! Leo: Alright Brett, its been nearly a year since the last time we interviewed you. OAC was still in the planning stages then and now its become a reality. Some of you may have already checked out www.oneareacode.com and know what it's all about but for everyone that hasn't heard of it or want to get a better insight into the program, what's new? You have clearly come a long way since the last time we talked. Brett: Yes, it’s been lots and lots of work this year for sure. I gave up my job and started working full time on the OneAreaCode back in May. To cap it all off, we have launched our first trial program called “Beanstalk.” It’s a junior skateboard development program running with our partner shops. We developed a board of directors consisting of skateboarders, managers of partner shops and distributions, parents of skaters who are on the beanstalk and business partners from outside of skateboarding. We have a solid team of volunteers and each week we are gaining more. Oh, I think the coolest thing has been that Andrew Pommier designed our mascot. And that’s what’s new. The mascot is definitely looking pretty sweet, can you break down how the Beanstalk program works? I know your first Beanstalk trail program is with Underworld skateshop in vancouver, will all the Beanstalk programs be launched through skateshops? The Beanstalk is a program designed to provide product incentive and mentors for a select group of school aged skaters to succeed at school, at home as contributors to their family, and on a skateboard as the next generation of positive talent. It is hosted through skate shops. The shops, 133, Coastal Riders and Underworld helped create the program, they have put countless time and money into this, together we are ironing out the bumps so that any skate shops who wants to use the beanstalk to help their young skate community can at next to no cost to the shop. Is there a limit on how many kids can participate per shop? If the underworld Beanstalk program is a success whats next? how far do you want to expand the Beanstalk? We have limited the Beanstalk to 100 kids total for greater Vancouver including the island. The success will be measured based off how well the kids achieve, and how the skateboard community grows as a result of this project, this will be a good five year process before we can say one way or the other. However, the Beanstalk is only one project for the OneAreaCode, there are many more to come, for now we are just focusing on the Beanstalk being 100 percent. You have clearly sacrificed a lot to make this happen, what motivated you to drop everything and start OneAreaCode? Life motivated me, actually, life gave me a great big kick in the arse to do something positive and wake up to the opportunities. I kept having these amazing people and situations come into my life, it was time to grow. So, I rolled the dice, quit my career, got focused, put my time and money where the mind was and really put myself on the line to try something positive. I learnt that if you take a chance on an opportunity and give it your all, it always leads to another opportunity and the next step. Well said, you recently dropped a new website an its looking really good, do you do all the web design? No, that was placed together by Cang Nguyen and Ryan Smith. It’s not really a web site, more just an online catalog for our programs. At the moment we have only one program. It’s not a site I would scream the world to go visit, more so just a place for people to log on if they were interested in the Beanstalk program. Well I think that pretty much sums it up, make sure to head over to www.oneareacode.com to learn more about the Beanstalk program. Stoked to see all your hard works paying off and the pieces are starting to fall into place! would you like to give any last words or shout outs? Defently like to shout out to YGT for the interview, 133, Underworld, OneLove, Coastal Riders, Boardwalk skate shops. S&J, Four Star and Ultimate distribution, all the skateboarders, families and business partners who are helping make this project a reality. Most importantly my friends and family for sticking with me. Thank you. This entry was posted on Saturday, 8 December 2012. You can follow any responses to this entry through the RSS 2.0. You can leave a response.